From LAIKA, the studio behind the hit filmCoraline, comes another marvel of stop-motion animation and creative storytelling. 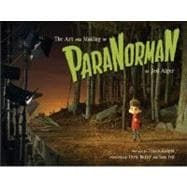 ForParaNorman, LAIKA's team of artists and animators built and brought to life a miniature town, a horde of zombies, and a quirky cast of characters to tell a tale of a boy with spooky talents who must save his hometown from a centuries-old curse. Featuring the amazing and detailed artwork that went into the film's creation-from character sketches and concept art to puppets, textiles, set dressing, and 3-D printed facial models-The Art and Making of ParaNormangoes behind the scenes to explore the exacting, exciting steps that are achieved frame by frame in this newest LAIKA masterpiece.